There are many different kinds of baby play mats on the market. These top rated play mats are great for providing a safe place for your baby to play that doesn’t have them directly on the floor, which many parents don’t want to do. Read about the features and benefits of these three top rated choices and see which one meets your needs. Parents love watching their babies advance through the growth stages and learn new skills. Creating a safe place for them to do that is very important to their health and your peace of mind. A play mat is a great way to provide your baby with a comfortable and sanitary place to get valuable tummy time. The top rated baby play mats that we have reviewed here are fantastic for allowing your baby to play on the floor in a clean environment. Getting plenty of floor time is important to the development of your baby. With any one of these baby play mats, your baby will enjoy being on the floor and discovering their little area of the world. One of the major benefits to letting your baby get plenty of play mat time is that they won’t develop the flat spots on the back of their heads that they can get from being on their backs or in seats for too long at a time. It also prevents tightness in their arms and legs because on the floor, they can stretch out. 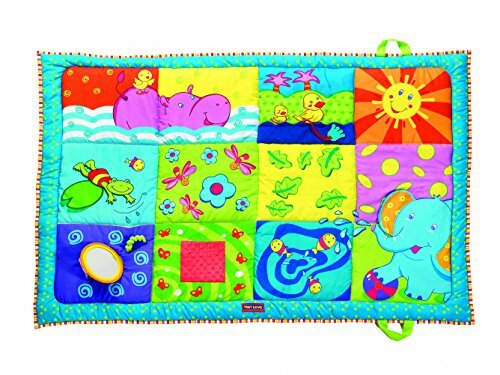 This colorful, reversible play mat provides your baby with a place to play from the time they are newborns until they are preschool or kindergarten age. It’s the perfect place for your baby to learn to push up, crawl, sit up, and roll. The soft, cushioned surface is a soft place for the baby to learn all these new skills and prevents injuries if the fall over or face plant into it as they are gaining strength and muscle control. The baby play mat wipes off easily, making it efficient and easy to keep clean. The bright, vibrant colors are appealing to babies and children of all ages. It is waterproof as well so spills and accidents don’t ruin the mat at all. This play mat works on all types of floor surfaces from hard wood to stone to tile. Carpeting may be a bit bumpy but it will still lay right over the top of the existing carpet. Storage is easy, just roll it up and it’s ready to store away. A handy tip: remember to roll it up inside out; that way when you unroll if the correct way, it will be ready to flatten out on its own. The cushioning that this play mat provides plenty of protection and comfort, preventing little knees from getting bruised or scraped. 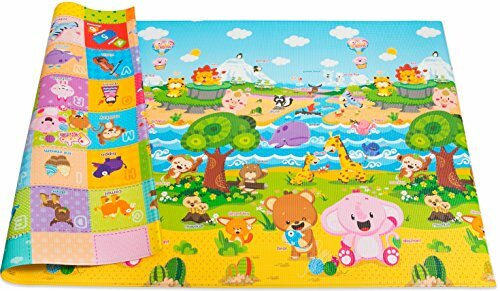 The design of this play mat has bright colors, numbers, characters and more to attract their interest. All you need to do to set it up is spread it out on the floor of whatever room you want to be in and lay your baby and his or her toys on top of it. Some parents put play gyms on it as well. It is the perfect way to give your baby much needed exercise in a safe way. The Tiny Love Super Mat Play yard offers your baby a safe and clean place to play no matter where you are. You can use it both inside and outside and it the perfect size for play dates. The different textures and accessories that this mat offers, engages your baby and gives them plenty to look at and experience. The Tiny Love Super Mat can be washed in the washing machine and is also portable with handles too. The play mat is 59” x 39”, giving the baby plenty of room to play alone or with a few of his or her baby friends. This play mat works well at the beach as well as in the back yard. There are several different accessories that this play mat offers your baby to play with. The first accessory this play mat has is a detachable mirror that can be laid flat on the play mat or you can tilt it up where the baby can look at themselves. The next accessory is a blue, foot-shaped teething ring. This is the perfect thing for sore gums during teething. Each brightly colored square offers your baby a different texture to feel and flaps that can be lifted and checked out. You can fold this mat easily and store it away or carry it to different destinations with the easy to use handles for carrying. The Tiny Love play mat is made of cotton and is illustrated attractively to keep baby’s interest. You baby is going to love playing on this mat and will be in a safe place with their toys on the mat as well. Never leave your baby unattended while on the floor or any other time they are awake unless they are safely in their crib with the railing up. The unique design of this play mat gives your baby a safe place to play and keeps their toys contained too. This play mat folds into a toy storage bag for maximum convenience. All you need to do is pull the drawstring and you’re done cleaning up. The sealed up bag has two shoulder straps that make the play mat easily transported anywhere. Babies can generate a lot of toys, and this is the perfect solution to keep them contained and easy to clean up. As your child gets older and starts playing with smaller toys, the toy storage bag/play mat still works great. Clean your baby’s play mat easily by either wiping it clean or washing it in the washing machine on the gentle cycle with cold water. Air dry your baby’s mat, don’t dry in the dryer. This is available in both turquoise and Bordeaux. Either color will work for a boy or girl. 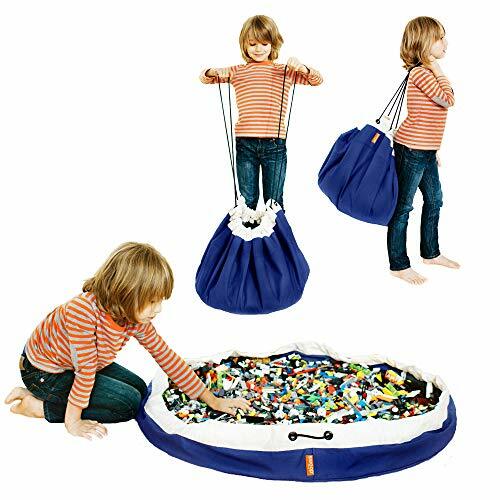 Your children will love playing on this simply designed play mat that converts into a bag. Consumers who purchase the Children Play Mat from Bow-Tiger will get a full refund if they choose to return it for any reason. Get the Bow Tiger play mat/storage bag and never have to worry about picking up little toys all over the place again. If you take a look at play mats online you will find that there are many different varieties of play mats that come in all sizes and designs. Some have interactive elements on the mats such as flaps and other accessories. The top rated baby play mats we have featured here are perfect for allowing your baby to play on the floor, exercise their muscles and stimulate their minds through interactive play. Even the solid, plain play mat is great for accomplishing this because you can put the baby’s toys on the mat and they won’t be able to roll away. They are the perfect accessory for playing safely. Continue reading below to learn more about baby play mats in our buyer’s guide. This guide is designed to provide you with the information you need to make an informed choice; one that you will be pleased with. There are two different types of play mats on the market: foam and fabric. Foam play mats give the baby plenty of cushioning to protect your baby from bumping their heads on a hard floor. There are many different designs of foam play mats with plenty of colorful designs to keep your baby entertained. The pros of a foam play mat are that they are not prone to bunching up the way fabric can and they are thick and comfortable with lots of cushion. Sometimes they may have an unpleasant odor at first so give them a chance to air out when you first open the package. Foam play mats are not as portable as fabric and don’t travel well. With fabric mats, you will not have the thickness and cushion but you will have convenience of easy transport and they are very soft. They tend to bunch up when the baby moves around which can be annoying to the baby and the parent if the baby keeps ending up in a bunched up play mat. Babies seem to prefer the play mats that have a lot of contrasting colors on them. They also love sensory items such as things that crinkle when they touch them or that rattle. There are several things that you can look for when it comes to choosing a play mat for your baby. They don’t have terrific eyesight until they are about 6 months of age so choose bright colors that are contrasting to grab their attention, rather than mats with a lot of small details. Remember that many baby products are geared to appeal to the parent, but they are not the ones who will be looking at the mat so try to look at the different designs from your baby’s point of view and look for designs that stand out. Interlocking foam play mats are a good choice for travel since they can come apart and then be put back together wherever you travel to. If you will be putting the play mat down on a non carpeted floor, look for mats that have non skid backing to prevent excessive slipping. Look for play mats that are at least twice the size of your baby’s body. This is going to be approximately 40” x 40”. This allows for plenty of movement as well as safety. You may find that once the baby is crawling, a foam play yard is better and will not bunch up under their little legs as they crawl. You will need to look at getting a play yard once they start crawling but you can put a play yard on top of a foam play mat and have a spectacular play place for your baby. Think about what you want your baby to get from the mat you want to purchase. Do you want one with several interactive games for the baby to engage in? Is color and design the most important things for you? Decide what you want for your baby in the play yard and look for styles that have those elements present in the model you choose. The key to a happy, healthy baby is not leaving them in any one place for too long or too often. Baby play mats are wonderful but if the baby is left there for too long they can become over stimulated. As your baby grows, their vision becomes sharper and they can take in more of the play mat toys and designs. They will also do well with play gyms that are set on top of the play mat. Once they start gaining more motor skills, they will start reaching for the interactive toys or the toys you lay on the mat for them. Never leave your baby unattended for any reason. Some parents purchase two play mats, one that can be left at home and one that they csn travel with. It’s easy to set up; just lay it on the floor, put the baby’s toys on it and watch them enjoy themselves. Never put the play mat on top of a bed or table. This poses a major safety hazard to the baby and should be avoided. If you choose to put the baby’s play mat in the living room or even in your office, it allows you to keep the baby close without having to hold them the entire time. A play mat doesn’t replace holding and cuddling. This is an important need babies have and should not be over looked in their development, but it does allow you to have time to do things where you need both your hands such as cooking a meal, helping another child or doing a chore or two. Just be sure to never leave the baby alone on their play mat. It is important that you keep your baby’s play mat clean. You need to clean it regularly and how you clean it will depend on the type of play mat you have purchased. It you chose a fabric play mat, cleaning it is super simple. All you need to do is put it in the washing machine with other baby laundry and you’re good to go. It is better for most play mats that they air dry on a line and not be dried in the dryer. If you have a foam play mat, keeping it clean is as simple as wiping it off carefully and making sure it remains in good condition with no tears, cracks or missing pieces. Check the foam pieces regularly for missing or torn pieces that the baby can rip off and then chew or choke on. Even though the play mat will go on the floor, you need to make sure it stays clean and that animals are not permitted on it. Play mats appeal to parents, both brand new and experienced. It doesn’t matter whether you want one for home use only or you intend to travel with it, there are many different options that you can choose from: Foam or Fabric, colors, themes, additional accessories, different sizes and much more. With all of these choices available, having the information you need to make a good choice is paramount. Knowledge of baby play mats will prevent you from purchasing one you don’t like and having to go through the headache of sending it back. Looking at the things you want in a baby play mat before you purchase will help you get the right one the first time. Play mats are a great baby item to get and you will find that you use it often to give your little one the exercise and tummy time that is so crucial to their good health and development. Choose one or even two that you feel your baby will enjoy, look for mats with a lot of accessories or visual activities and watch your baby flourish as they grow.